The numerous terrorist attacks in 2016 persisted into the New Year with a deadly attack on the very first day of 2017; 39 people were killed and 70 injured in a mass shooting in an Istanbul nightclub. Numerous terrorist attacks followed, mostly in the Middle East, Africa, Afghanistan and Pakistan. Many of the attacks, which took the form of suicide car bombings and shootings, were carried out or claimed by the ‘Islamic State’ (IS) terrorist group. Other militant groups involved included Boko Haram, Al Shabaab and the Taliban (in Afghanistan). Al Qaeda militants have also been active. An affiliate of Al Qaeda in the Islamic Maghreb (AQIM), Al Mourabitoun, claimed responsibility for the deadly suicide car bombing attack at an army camp in Mali on 18 January killing at least 77 people and injuring over 110. In Yemen, Al Qaeda in the Arabian Peninsula (AQAP) killed and injured over a dozen Yemeni soldiers on 3 January. Al Qaeda has also stepped up its propaganda effort, releasing statements by IS leader Ayman al-Zawahiri calling for attacks against the US, saying that it was a “top priority” target. Reflecting the internecine warfare within the global jihadi movement, Zawahiri also denounced IS propaganda campaign against Al-Qaeda and eulogised a number of Al Qaeda ‘martyrs’. The next few months will be crucial for IS as coalition forces stepped up its campaign to recapture Mosul and Raqqa and dismantle its so-called caliphate. So far, eastern Mosul has been liberated although the battle ahead for western Mosul is predicted to be challenging. US President Donald Trump, inaugurated on 20 January, has vowed to work with other countries including Russia to crush IS and eradicate terrorism. Meanwhile, Russia and Turkey have started joint operations against IS near the Syrian town of Al-Bab. These, and other developments on the ground such as the loss of IS-held territories, top IS leaders, fighters and sources of funds will determine IS’ future in Iraq and Syria and the directions it will take in the coming months. IS is expected to expand the ‘battlefield’ to the West and elsewhere, and consolidate and expand its many wilayats (provinces) and enclaves outside the Levant, stretching from Western Africa to Southeast Asia. 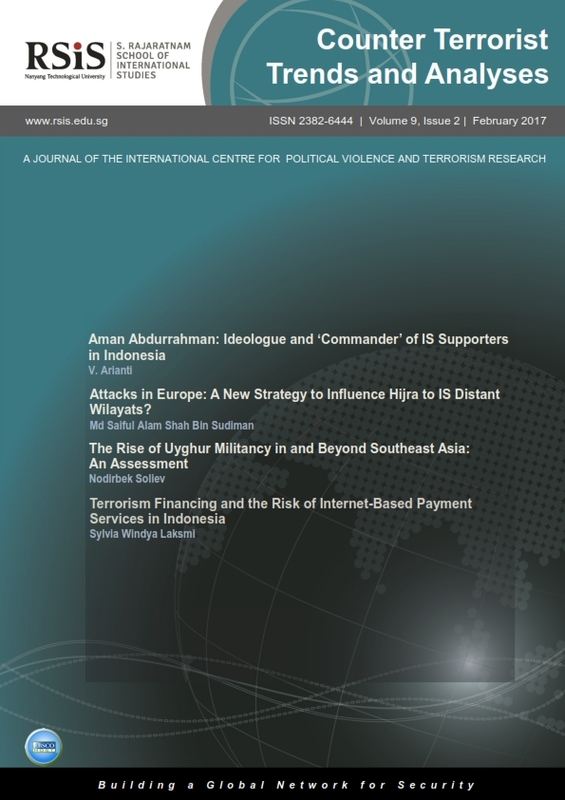 The articles in this month’s issue deal with IS militants in and beyond Southeast Asia, IS’ exploitation of religion, rising Uyghur militancy and terrorism financing. V Arianti focuses on a key IS ideologue and ‘commander’ in Indonesia, Aman Abdurrahman, leader of Jamaah Ansharud Daulah (JAD) who is behind bars. The US has recently designated JAD as a terrorist organisation and imposed sanctions on Aman Abdurrahman who has provided ideological and spiritual leadership to IS supporters in Indonesia since 2013, and is alleged to have been behind the January 2016 Jakarta attacks which killed 8 people. She discusses how Aman Abduhrrahman succeeded in spreading radical ideology and unifying pro-IS groups, and his connections with IS in Syria. Md Saiful Alam Shah Bin Sudiman explores the ‘Islamic State’ (IS) terrorist group’s exploitation of Islamic precedents to falsely argue that hijra (emigration) to IS-held territories and wilayats is obligatory and an act of worship. The writer draws attention to IS’ cold calculated strategy of fomenting inter-religious discord and creating a ‘hostile’ environment in Europe to ‘encourage’ Muslims there to emigrate. He recommends steps European governments and Muslim communities should take to maintain social cohesion and inter-religious harmony, and counter IS false narratives and propaganda. Nodirbek Soliev looks at the growing militancy of disaffected Xinjiang Uyghurs, their recruitment by IS and Al Qaeda, their movement into Southeast Asia and the risk of such Uyghurs linking up with existing militant groups in the region. The writer also highlights the need to achieve long-lasting stability in Xinjiang by developing comprehensive counter-radicalisation and community engagement strategies, relying less on hard power and more on winning “hearts and minds” of its Uyghur minority community. The use of new payment methods to make illicit cross-border money transfers has reignited concerns about the lack of regulation in regards to such payment methods and the misuse of such channels by terrorists to fund their activities. Sylvia Windya Laksmi highlights the abuse of modern payment methods over the Internet and outlines three challenges faced by the Indonesian authorities in particular, based on the existing frameworks in place. She offers four policy recommendations to tackle the problems associated with combating terrorism financing.